A classic in a vertical format, a vivid and scenic beach sunrise with palm trees on the Palm Cove Beach in Cairns, Queensland (QLD), Australia. 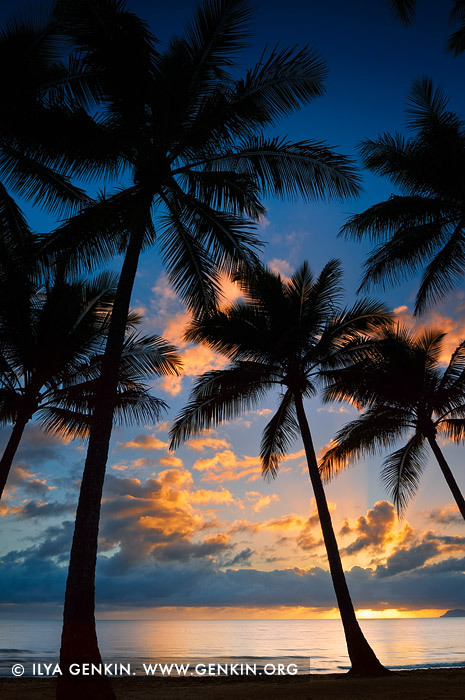 It hardly gets more classic than this sunrise or sunset framed with palm trees on a scenic beach in tropical Queensland in Australia photographed as a vertical panorama photo. The tropical Queensland and especially Cairns are well known vacation spots in Australia. This image is the perfect photo for a wall at home, it makes the room into a vacation spot! This image belongs to the travel and nature stock photo library. This stock photo of Vivid Sunrise at Palm Cove is available for licensing for commercial and editorial uses including websites, blogs, books, magazines, brochures and advertising. Restrictions may apply for images which contain third party copyrighted material or sensitive subjects. Photos of artwork are for editorial use only. This image id PALM-COVE-QLD-AU-0004 of Vivid Sunrise at Palm Cove, is copyrighted © by Ilya Genkin. This is not a public domain image.